Every year people resolve to make changes in their lives at the beginning of the new year. The most popular New Year’s resolutions are to lose weight, stop smoking, exercise more, learn a new skill, eat healthier, get a new job, etc. These are all admirable goals and while some folks start the year off strong and may even drop a few pounds or hit the gym three times a week for the entire month of January, or opt for that salad instead of fries and a diet coke for lunch, the task they’ve resolved to tackle typically is either too much to maintain or falls off of their radar because it simply doesn’t fit into their routine long-term. The secret to succeeding with your new year’s resolution is to find something you really need to do, dropping a few pounds for example, and then finding a way to do it that doesn’t feel like a burden or an added stressor. This can be hit or miss - sometimes it takes a little trial and error to find an activity we enjoy doing. Just because you do something and it doesn’t turn out exactly how you anticipated, doesn’t mean you can’t move on to another activity and give it a try. That’s actually part of the fun - trying new things and finding one that fits you perfectly can be an amazing experience in and of itself! So don’t be afraid to hit and miss. If it’s a new skill you’d like to tackle for the new year, the hit or miss rule can apply here, too. Do you think you like to sew, but because you’ve never really done it before, you don’t want to invest in a sewing machine, materials and fabric just to ‘give it a try’? You don’t have to! Take a class at a local craft store. If you find you love to sew after a few weeks’ worth of classes, then you can start to invest in you new found hobby. If not, move on to another activity and give it a try!For example, running is great, but may not be realistic long term for various reasons - it is high impact and can be tough to maintain for those with back or knee issues. So, try walking instead. You can get a terrific workout by walking. There’s less impact on your body and you can create more challenging walks by adding arm or ankle weights and walking in areas with a steeper incline or in the mountains along high incline trails. Then there’s one of our favorite activities for maintaining health - CYCLING! There’s a reason why you loved riding your bike when you were a kid ... it’s because cycling is AWESOME! There’s nothing like that feeling you get when you’re cycling. Some people may be intimidated by the initial investment they perceive as being necessary to start to ‘really’ cycle, but it doesn’t have to break the bank at all! There are plenty of used cycles out there and affordable gear for you and the family . And that brings us to the best part about cycling - it’s a method of exercise that you can easily venture out on an early Saturday morning and do alone, or you can head out with the family and make a day of it! Once you find something you truly love to do, there are multiple options to get you on your way to learning more about it. Do you enjoy working with wood? Find a woodworking course at your local community college or, better yet, reach out to a retired person in your community who is an expert in the field you’re curious about and ask them if they’d mind teaching you the ins and outs of that skill! Not only are you learning more about something you’ve always wanted to know, you’re hanging out with a new friend who is able to pass on their knowledge to you. One of the reasons why new year’s resolutions end up fabulously failing after a few weeks is because they become too overwhelming and simply cannot to fit into our daily lives comfortably without us feeling like we’re having to sacrifice something we must do or something we’d rather do to accommodate for our new activity. Finding the right activity is key and while it may take some time to find the perfect fit, it’ll be worth it because you may just find that your new year’s resolution has now turned into an enriching, everyday addition to your daily routine - and is one that you can’t imagine not being part of your life. 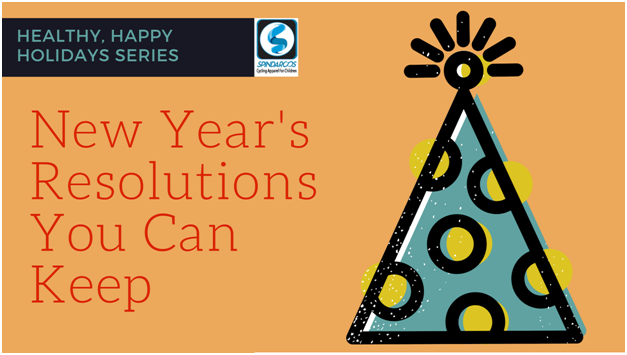 Happy New Year from all of us at Spindaroos!